← Chicago’s First Chinese Laundry? 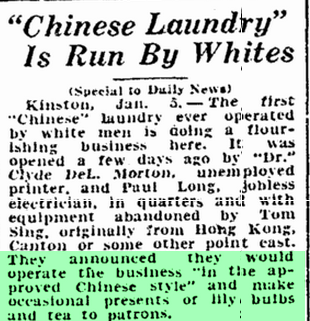 In 1932, during the Great Depression two white men decided to take over the operation of Tom Sing’s Chinese laundry in Kinston, North Carolina. Times were hard then, as the men, an electrician and a printer, were both unemployed. Sing must have also had financial woes as he abandoned his laundry and its equipment intact. I do not have any information about how successful this novel experiment involving the first whites to run a Chinese laundry, but judging from their mis-conception that the ‘approved Chinese style’ for a laundry was to gift customers with lily bulbs and tea, I suspect they did not last very long.